Chris Msando was hired to help make sure Kenya's election went off without a hitch. His body was found one week before the vote. 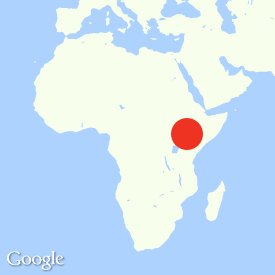 Now his family, his friends, and people across Kenya are asking: Who wanted him dead? NAIROBI — Early in the morning on July 31, eight days before a highly contested election that would plunge the country into a crisis unlike any it had seen before, the man responsible for designing the electronic system to ensure a fair and accurate vote was found brutally murdered. Authorities found the body of Chris Msando, the deputy IT manager of Kenya’s Independent Electoral and Boundaries Commission (IEBC), on the side of the road in a town called Kikuyu, about 12 miles northwest of Nairobi. Police also found the body of a 21-year-old woman next to him; both of their clothes had been removed. Early reports indicated that Msando’s arm had been chopped off, but a pathologist later clarified that he had suffered several cuts to his arm and other signs of torture. Officials said the cause for his death was strangulation. Kenya’s Directorate of Criminal Investigations continues the probe into his killing. Nearly a month after Msando’s murder and the election that saw President Uhuru Kenyatta reelected, sparking protests around the country, its Supreme Court nullified the result, citing irregularities. Kenyans will head back to the polls on Oct. 26. But over it all hangs the shadow of Msando. Some independent journalists and politicians from the opposition party say there is a deliberate attempt to stall his murder investigation. Others have gone so far as to suggest that Msando’s death was carried out by the government because the electronic voting system he was in charge of posed a threat to a ruling party that wanted to rig the elections. In his first in-depth interview since Msando’s death, his older brother, Peter Msando, voiced skepticism over details surrounding his brother’s killing. “His death was a bit strange and we still don’t know the motive behind his killing. This is why we want to bring it to the outside world’s attention,” Peter told BuzzFeed News. 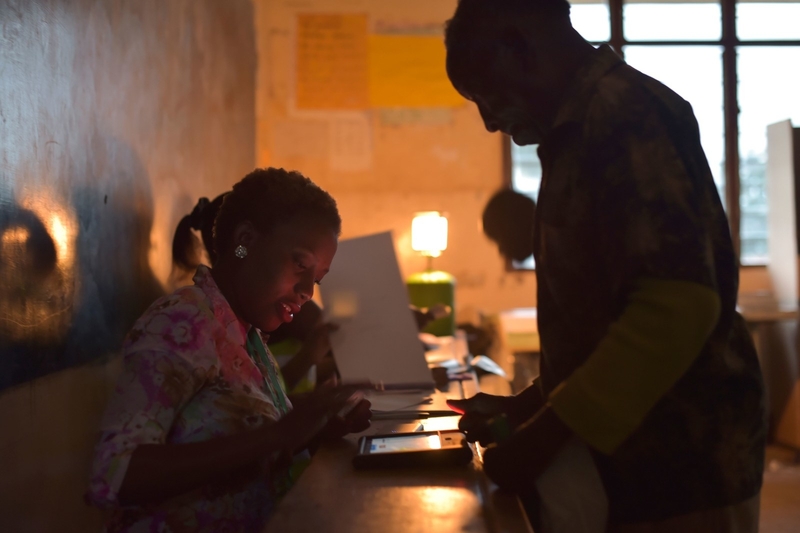 An election official (left) registers a voter at a polling station in Mombasa. Voting officials (right) count ballots at a polling station in Kisumu. Peter wanted to be excited for his brother when Chris announced in November 2016 that the election commission had offered him a job nine months before voting day. As the deputy IT manager, Chris led the implementation of a new system that used biometric identification to prevent people from voting more than once, provided polling updates every three hours, and selected the strongest wireless network through which the results would be sent. The goal was to ensure an efficient and transparent election process for the millions of Kenyans who would take to the polls the following summer. But Peter also had concerns about his brother’s new job. President Kenyatta had appointed Wafula Chebukati as the new chairman of the IEBC. Kenyatta’s pick surprised some, given that other candidates for the position performed better than Chebukati during the selection process, raising questions about whether or not his appointment signaled special treatment from the president. Peter remembers asking Chris if he was worried about working for what he believed was a controversial organization. “But Chris said, ‘No, let me go work there,’” and accepted the job enthusiastically. About a month into the new job, Chris told his family he had begun to receive mysterious and threatening messages. Peter said Chris reported the threats to the police and went about his business. Then, on July 28, Chris went missing, shortly after appearing on a local TV network to discuss the elections. After several of his calls went unanswered, Peter reached out to Chris’s wife, Eve. They took turns reassuring each other that Chris had probably just turned off his phone because it was Friday and he wanted to disconnect from the furor of election season. Eve Msando declined to be interviewed for this story. But after the family didn’t hear from him for two days, Peter, Eve, and a few other relatives went to the police to report him missing. Then they asked Chebukati to put out a statement on behalf of the electoral commission that Chris had disappeared, and that the organization was working with police to find him. Feeling confident that authorities would locate him, Peter and his extended family left Chebukati’s office and went home. Around 1 a.m. the next day, he received a WhatsApp message from a cousin: It was a photo of Chris’s car on the side of the road in Nairobi. After confirming that the car did in fact belong to Chris, Peter and Eve immediately called the divisional criminal investigations officer (who oversees the department that deals with homicide cases). He dispatched police to the scene. Chris Msando’s murder made international headlines, but quickly faded into the background as the Aug. 8 vote approached. In the months leading up to Kenya’s elections, the tight race between Kenyatta, the incumbent, and longtime opposition leader Raila Odinga had raised concerns over whether the country would see a repeat of the horrific postelection violence that plagued the country in 2007. 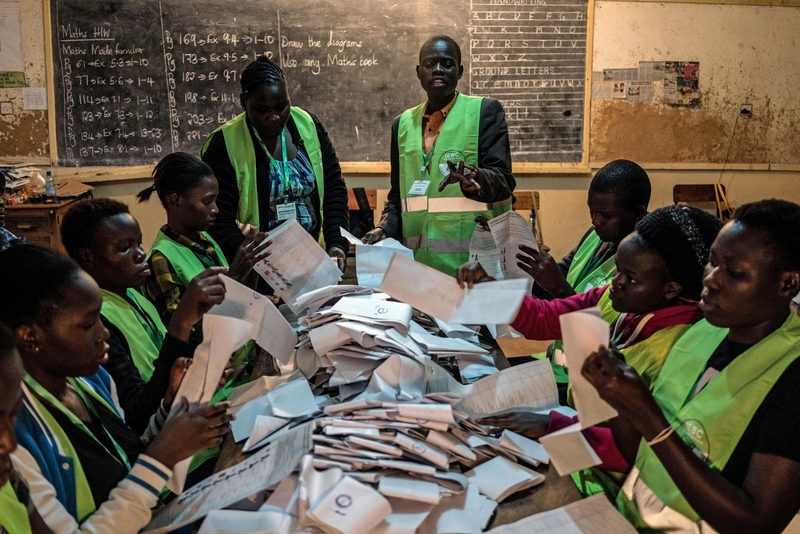 Leading international organizations, including The Carter Center and the European Union, poured more than $24 million into a United Nations Development Fund project to support a fair election. That money, combined with the estimated $1 billion that Kenya’s National Treasury expected to spend on the electoral commission and security, led some people to project that it would be the most expensive election in the world. The day of the vote itself went relatively smoothly, save for a few technical glitches that included biometric systems that did not recognize people’s fingerprints and late starts at some polling stations. Local and international media lauded the country for transcending its bloody past even before the polls had closed. But tension began to mount when, later that night, Odinga declared ahead of the official results that hackers had used Msando’s identity to tamper with the voter transmission technology, compromising the elections. International observers, including former US secretary of state John Kerry, quickly shut down his claims. Kenyatta went on to win reelection by nearly 1.4 million votes. Odinga immediately submitted a petition to the Supreme Court challenging the results. On Sept. 1, the six-member bench decided in a 4–2 vote that the presidential elections had not been conducted in accordance with the constitution due to irregularities and illegalities in the vote-tallying and vote-transmission processes, and effectively nullified the results. The court said the election commission had also refused previous court orders to turn over voter information. “The IEBC’s IT system was infiltrated and compromised and the data therein interfered with, or IEBC’s officials themselves interfered with the data or simply refused to accept that it had bungled the whole transmission system and were unable to verify the data,” the deputy chief justice said. The justices did not directly mention Msando in their report. The inconsistencies cited in the Supreme Court’s decision were the very things Msando had sought to improve in his role at the election commission. The court decision was both unprecedented and historical — Odinga had petitioned the court before, but the court had always overturned it — and the judges have since been praised by local and international observers for honoring the standards of democracy despite overwhelming reports that the elections had been carried out fairly. The results from all other parliamentary races were upheld; only the presidential vote was nullified. The inconsistencies cited in the Supreme Court’s decision were the very things Msando had sought to improve in his role at the election commission. Those who remain invested in his case have raised questions about the investigation — there’s the fact that police have yet to disclose the details of Msando’s phone records, and also the arrests of two people who had little to no contact with Msando in connection to his murder, a former landlord and a 17-year-old girl. Police in Nairobi have failed to provide the identification of the official responsible for updates on the investigation of Msando’s killing. Over the past three weeks, a number of Kenya National Police officials referred BuzzFeed News to Director of Criminal Investigations Ndegwa Muhoro, police spokesperson George Kinoti, and Inspector General Joseph Boinnet, who presides over the entire police force. Several calls to each of the officials went unanswered, and when an officer did pick up, they indicated that they would respond later. BuzzFeed News has not received any comments. Electoral commission spokesperson Andrew Limo reiterated the organization’s stance from July regarding Msando’s case. When asked to comment on the status of Msando’s investigation, Raphael Tuju, the spokesperson for the ruling Jubilee Party of Kenya, told BuzzFeed News that the party had taken no stance on the case. Another representative said the party would refer all questions about the case to the police and would not comment further. One opposition leader said the investigation into Msando’s murder bears similarities to those of two other men — an influential businessman and a human rights attorney — who were shot to death inside their cars in Nairobi in May and June 2016, respectively. Both of their cases remain open, and the government has not commented on either of them since last year. 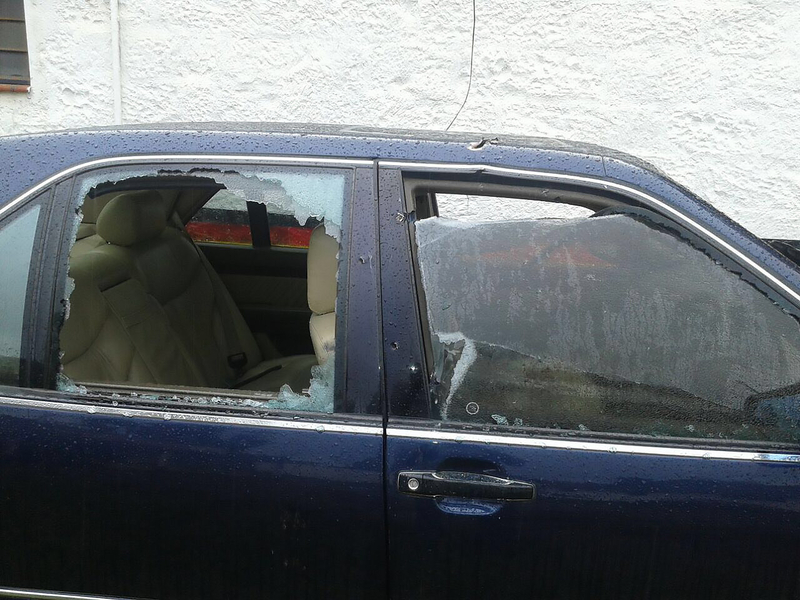 A photo from 2016 (left) shows the bullet riddled car of Kenyan businessman Jacob Juma in Nairobi. 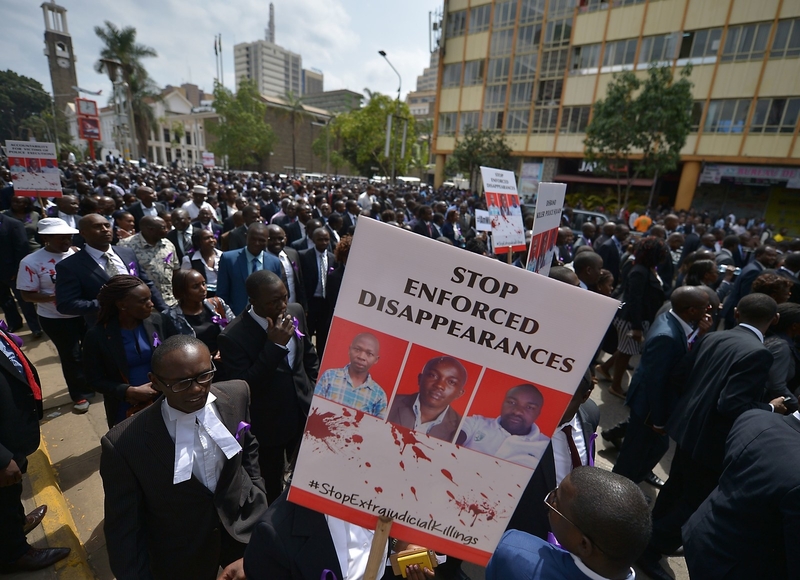 Kenyan lawyers (right) protest the extrajudicial killings of three men by Kenyan police in 2016. One of the men killed was a human rights lawyer. One of the first people to reach out to the Msando family after Chris went missing was Seth Dikembe, the deputy communications director for opposition leader Odinga’s Orange Democratic Movement. Odinga attended Msando’s funeral in August and since then has, along with other senior opposition leaders, been using the case to point fingers at the police, accusing it of being a proxy for the ruling party. “I had a strong feeling that Msando had been killed when he was declared missing,” 28-year-old Dikembe, who also goes by Seth Odongo, said in an interview with BuzzFeed News in Nairobi last month. Dikembe said that after he approached Msando’s family about his whereabouts, he began to notice people following him on the road. A few days later, his wife told him that she had seen people driving near their house. He felt that someone was trying to send him a message. “I took the intimidation as ‘You know what’s going on, but don’t break this news,’” he said. So he left Nairobi for a week, and returned right before the elections. Since the investigation began two months ago, authorities have revealed only a few details about Msando’s murder. Investigators said the IEBC manager owned four cell phones, all of which were registered to Safaricom, one of the largest cell phone data and internet providers in the country. But officials have not disclosed any information about the calls or messages Msando may have made in the hours leading up to his death, nor about his location. The police did not respond to multiple requests for more details about the case. In an interview with BuzzFeed News, Safaricom CEO Bob Collymore said the police could easily obtain this information from the company with a court order, but said he was not aware if authorities had submitted one. He added that even if they had, nobody at Safaricom would be able to confirm it because of the confidential nature of the investigation. However, Kenyan police have gathered enough information from the mobile data to arrest two people based on their phone interactions with Msando. The first suspect they arrested was Andrew Kipkoech Rono, Msando’s former landlord and an accountant. Police said they arrested Rono on Aug. 14 after he sent Msando an allegedly threatening text message — he was released after he was held in jail for 19 days after a judge ruled that the prosecution did not have enough evidence to charge him with murder. On Aug. 21, authorities arrested a 17-year-old girl, who, according to her brother, made an accidental call to Msando. She was released the following week. Demonstrators protest the death of Chris Msando. The woman whose body was found next to Msando was a 21-year-old university student named Carol Ngumbu, which led to rumors that his murder was the result of a lover’s quarrel. Peter did not confirm whether or not his brother and Ngumbu were romantically involved, but said it was common for married men to have girlfriends in Kenya. Robert Alai, a political blogger who has been following Msando’s case, told BuzzFeed News last month that the government’s lack of urgency in solving Msando’s murder made it difficult to believe they were remaining neutral as they looked into the case. The last time they spoke, Peter Msando said he had urged his brother to hire a security detail and to consider buying a gun for his protection. Peter remembered telling his brother that some people were determined to win the elections at any cost. He said that Chris shrugged off those concerns. As Peter mourns the loss of his brother, he said he is struggling to maintain hope for justice.